Like former mayor Michael Bloomberg, a group of researchers envision a sustainable New York City -- with bikes, planting new trees, reducing citywide greenhouse gas emissions -- but that's where the similarities end. 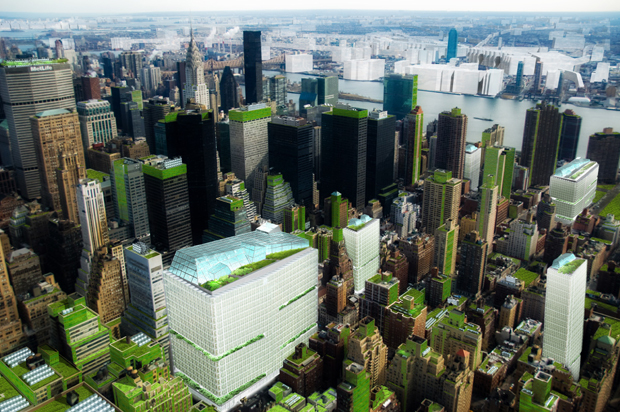 In a bold new "thought-experiment," the Terreform Center for Advanced Urban Research, a multidisciplinary non-profit organization, tried to envision a fully sustainable New York City, with entire streets and avenues converted into greenways and farms. In a city with nearly 8.3 million residents, 4 million acres of food-producing land -- roughly the size of Connecticut -- is required to feed their appetites annually. Combined with carbon emissions from transporting the food -- these so-called "food miles" -- it's no wonder why some studies list food production as the one of the leading contributors to climate change. The team involved in the New York City (Steady) State project was headed by Michael Sorkin. They chose New York City as the focus of the project as it is both dense and largely built-out, which present very particular challenges. Sorkin, a professor of architecture and director of the Graduate Urban Design Program at the City College of New York, says that this project hopes to show what other cities can do when faced with similar obstacles. "Our study means to have implications for all cities that are seeking to take greater responsibility for their impact on the planet," he told CBS News in an email. "We [also] believe that cities are logical increments of political organization, particularly in an era of indifferent multinationals and incompetent nation states." Setting out to find if New York City can become self-sufficient within its current boundaries, the team repurposed present-day buildings as food production stations. Architectural renderings represent a seemingly utopian future, "using a combination of existing technologies, common sense and an inventive spirit of design," Sorkin said. According to the project website, several paradigm shifts must occur in order for the city to be fully self-sufficient. Stressing economic independence and self-sufficiency, the team envisions this to happen through the creation of an inter-borough exchange of production networks, utilizing a variety of skyscraper farms for plants and animals, as well as reclaiming streets and city blocks to grow food. According to the team's calculations, using these food production systems would allow the city to produce 2,500 calories for each person per day. "While 100 [percent] autonomy is often impossible, unnecessary or impractical, we have looked for a series of 'sweet spots' that could be transformative and move us a long distance in the direction of greater sustainability," said Sorkin. These so-called "sweet spots" could include using something as simple as window boxes to grow food; using the subways as freight; encompassing the territory with a 100-mile radius around the city; or perhaps even reusing the 19th-century Erie Canal for a statewide system, Sorkin explains in Aeoth Magazine. The team has no real interest in seeing everything implemented exactly as they depicted it, assures Sorkin. This project is meant to serve as a encyclopedia of sorts -- one that includes the technology and morphology that can help shape the forms and futures of cities around the world. Rather than waiting for the ultimate solution to be implemented, Sorkin explains that cities already have the ability to shrink their carbon footprint now -- whether it be through constructing net-zero carbon buildings or better insulating buildings. "We pride ourselves in suggesting no solutions that are outside technologies that are currently available," Sorkin says. "What's missing is the will to put them to appropriate use." Still, he admits that the study is a work in progress. "We're looking at a wide range of urban respiratory functions, including food, water, air, climate, movement, construction, energy, waste and manufacturing -- and have several years to run in the study," Sorkin explained. "While much of our work is both formally and politically visionary, it isn't rocket science and we think that there are [many] useful proposal embedded in it."